As the range of TC Electronics stompboxes continues to grow, their appearance on an increasing number of professional and amateur boards continues. Some, such as the Hall Of Fame reverb and Flashback delay, are becoming the default choice for many, while units such as the Ditto have opened up new musical avenues hitherto scorned by the more technophobic incumbents of the guitar-playing community. On test here, we have two additions to the range; a sophisticated noise gate and a multiband compressor. 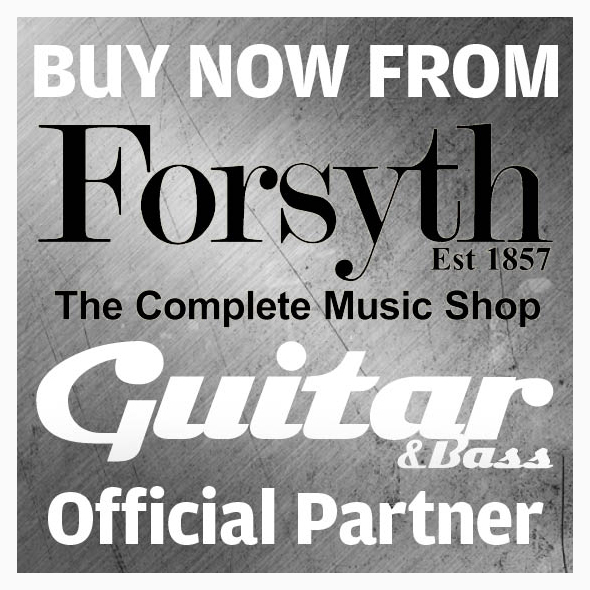 Both possess the same modest footprint as their TC siblings and come fully equipped with TonePrint compatibility. We went into detail about TonePrint in October’s issue but, in a nutshell, the system allows you to `beam’ artist settings direct from the relevant app on your smartphone into the pedal via your guitar’s pickups. Yeah, and pigs might fly, right? Well, pop a saddle on Captain Oinksalot because the concept works seamlessly and it’s arguably the simplest way of getting your favourite guitar player’s personal settings into your own rig. The Sentry includes a trio of dedicated pots: threshold, which sets the gate’s sensitivity; damp, which controls the ferocity of the gate’s closing, and decay, for regulating how your notes fade in relation to the gate’s aperture. There are also two modes alongside the TonePrint option, accessed by a three-way micro toggle. 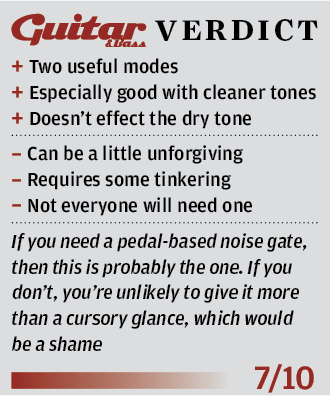 Gate relates to the pedal’s single-band gate nature, while hiss is the multiband option that, as it’s name suggests, is best suited to obliterating hisses and spits. Both pedals come with their own USB cable and can be powered either by an optional nine-volt PSU or PP3 battery, the compartment for which can be located by removing the baseplate’s single screw. Also within is a pair of dip switches, one of which alternates between true or buffered bypass operation, while the second has no the function we’re aware of. 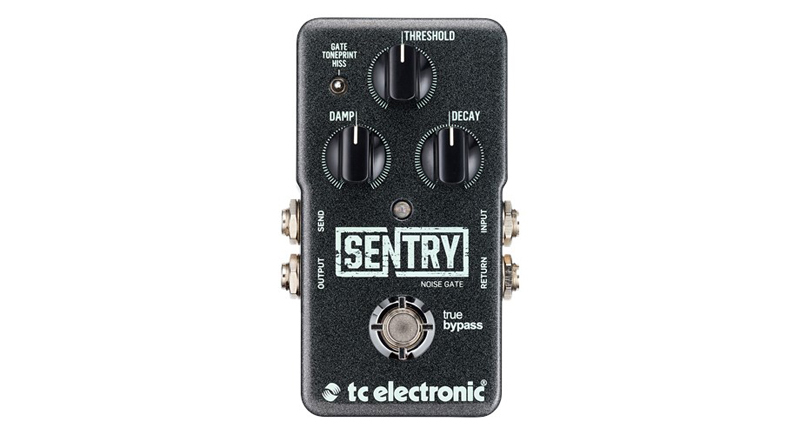 The Sentry also includes a mono effects loop to allow you to feed any noise-producing items – overdrives, for example ± through the pedal. This lets the gate be triggered by the direct signal, not the noise produced by your vintage Big Muff, and might just prove to be the Sentry’s USP. Anyone already familiar with TC pedals will be aware of how advanced they can be yet, with many of them, it’s usually far more fun to dive straight in and find your own sounds. Here, though, we quickly discovered that to get the best out of the Sentry in purely practical terms we had to fine-tune the settings to get the gate in just the right place to let the note through with the minimum amount of hiss. Arguably the only way to do this with the required level of accuracy is on your computer or iPad using the truly brilliant TonePrint editor; the trio of controls will only get you so far. It does take some tinkering with, but it’s certainly worth it and reassuringly easy to use once you get the hang of it. 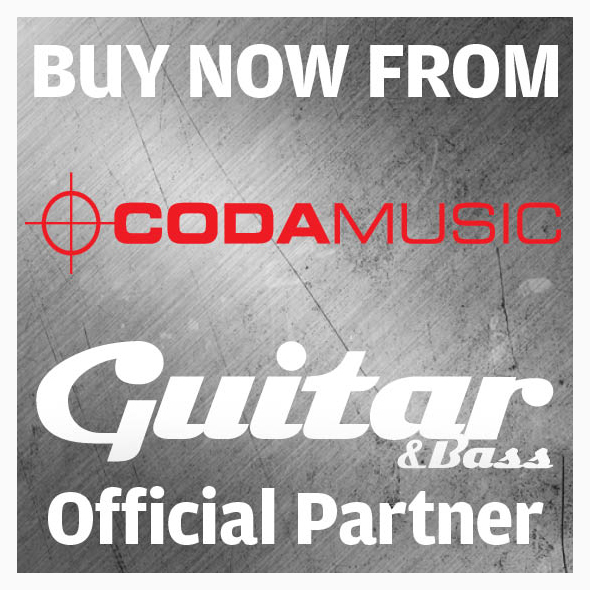 For our sound tests, we stuck with what we feel are likely to be the two most common noise sources for guitarists: single-coil hum and the hiss of an overdriven rock amp turned up to stun. Going for a reasonably driven blues-style tone with our Road Worn Stratocaster through a Blackstar combo, the Sentry worked a little of its magic almost straight away, removing the single-coil hum without infringing on the tone. In hiss mode, we found that we could easily find the threshold and needed only a couple of minutes to set the decay and damp to suit our tastes. The pedal’s LED changes from red to green when the gate is open, too, which helps greatly in finding the sweet spot. Eliminating noise from a high-gain rig is a somewhat more elaborate task that involved a spot of delving with the TonePrint editor in gate mode. Be warned, though: as with all noise gates we have had experience with, we found obtaining a natural sustain without causing the gate to close, thus chopping off the signal, did take some time to get just right ± and we’re still not totally happy with our results. Perhaps the most important question to address when considering the usefulness of the HyperGravity is simply do you actually need a pedal-based noise gate? As ever, that will be down to the intricacies of your own rig and circumstances, but we’re pretty sure Stevie Ray Vaughan didn’t bother with one when faced with the undoubtedly ear-lacerating maelstrom of his Tube Screamer’d Fender backline. That said, if you are in the market, they don’t get better than the Sentry. The multiband concept is also applied with TC’s newest stompbox compressor. Alongside three pots whose operation will be familiar to you from other compressors on the market is the blend control, which mixes the dry signal with the compressed tone. 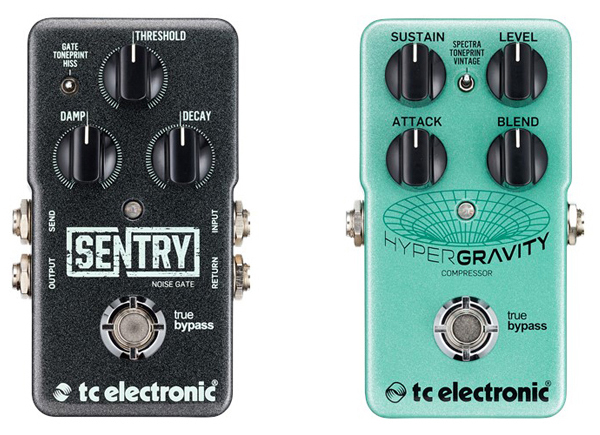 The HyperGravity’s two modes – known as spectra and vintage – offer a choice of either a sparkling, hi-fidelity compression or the darker, more pronounced squeeze of a vintage pedal, the latter coming from a recreation of circuitry taken from an analogue classic. According to TC, one sonic trait of multiband compression is that you can ensure no part of the tonal spectrum is compressed too heavily or lightly. Getting into the guts with the TonePrint editor lets you address the muffled high-end by dialling the compression back in that area, leaving the mid and lows unsquashed. 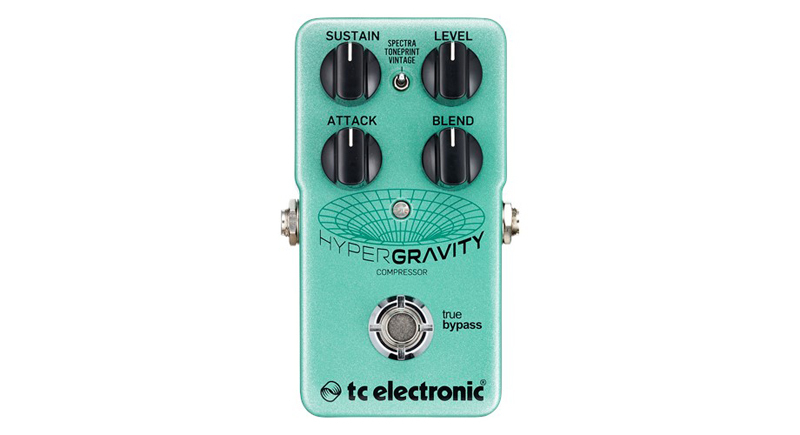 The blend control ensures the squeezing never becomes intrusive and, by keeping the sustain low and the level to around 60 percent, the HyperGravity becomes what every player craves: a `sounds better’ pedal, especially with a touch of amp drive. From meaty country pickin’ to choppy funked-up rhythms, the HyperGravity covers all bases well and should you prefer the grungy asphyxiation of those classic analogue comps, vintage mode is genuinely indistinguishable from the real thing. 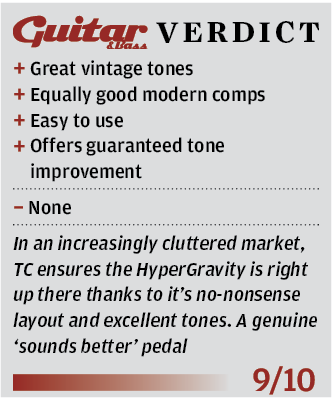 We like the HyperGravity; it’s easy to use, sounds great and is never too heavy on the squeeze – unless you set it so. Incorporating the standard TC Electronic mix of science and innovation with a straightforward system of operation and quality tones, these are two pedals worth jotting onto your `must try’ list.